I was looking at a website that had old pictures of different locations in Western Pennsylvania, and it got me thinking about many of my trips to my grandfather's house in Uniontown, PA, and driving through the mountains to get there, which is awesome. I have such great memories of my many solo driving trips to his house, which I started taking in my early 20s when I was old enough to be trusted to take a trip like that by myself. The fastest, most direct way to get to Uniontown from the DC area is to take I-70 west out of Frederick, then jump on I-68 just past Hancock, the unofficial halfway point. When you get to Keyser's Ridge in Western Maryland, you take old US 40 into the mountains, cross into PA, and continue into Uniontown. It's a spectacularly scenic drive, and takes just under 4 hours to get there. 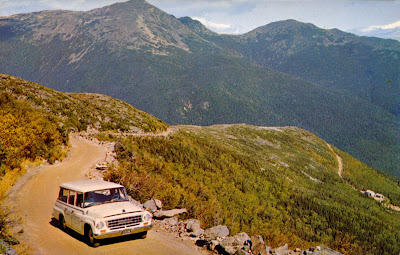 When I was a kid, the road west out of Hancock was mostly 2 lanes, long before the divided highway was completed, and it took a lot longer since the road seemed to ride the lay of the land instead of how the highways are graded over (and through) the mountains now. Going up the mountains on those old 2 lanes meant sometimes getting stuck behind trucks, and they weren't going very fast. As construction began on what was old US 48 to convert it to interstate status, it was neat to see how the old road would get bypassed as each stretch of new highway was finished. Since we made the trip about once a month, it was easy to see the way the new road would make travel so much easier. When it was finally completed, it cut almost an hour off the trip. US 48 was now I-68. Old US 40 was co-signed with I-68, and 40 became "Scenic" US 40, where it still remained. Parts of it disappeared completely under the new 68. Nostalgia is a funny thing. After getting used to the new highway for almost a decade, and the fact that I was driving myself, I now wanted to ride on the old road, and I more and more found myself jumping off the interstate and taking the old road as much as possible. It was a lot more fun. Taking the old road made for some scenic driving, and I liked finding other similar roads. 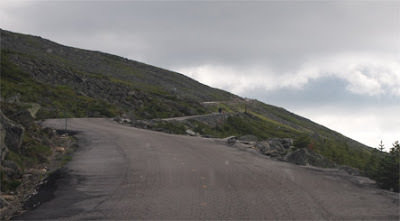 In fact, I started searching out mountain roads any chance I could just to be able to drive them. In 1995, I took a solo trip to New England. 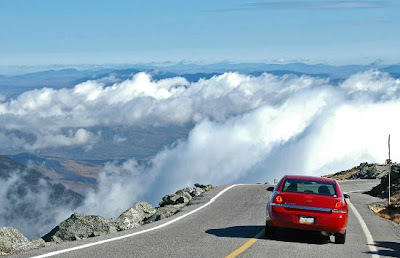 I had heard about a road that goes to the top of Mount Washington in New Hampshire's White Mountains, and I decided to take it. 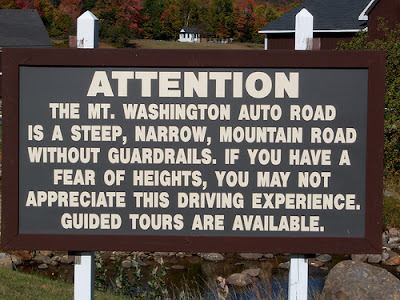 There were signs at the bottom of the mountain warning that the road was dangerous, steep, and had no guardrails in some places. The sign emphasized that people with a fear of heights may not enjoy this driving experience. I couldn't imagine any road being so bad that I couldn't drive it, so I didn't pause and kept on going. The road started climbing fairly rapidly, with many switchbacks, and before I knew it, the road had risen above the treeline. It was at that point that I started to notice just how high up I was, and without guardrails, I realized that I might have a severe fear of heights. The fear gripped me so much that I actually felt panicky, and I was sweating to beat the band. There was nowhere to pull off the road, so I had to keep going, as a line of cars began to form behind me. Fortunately, because of the switchbacks, I had a reprieve when my lane was on the inside, but when it was on the outside, my heart was in my throat. The road was barely wide enough for two cars to pass each other. I was so relieved when I got to the top of the mountain and found a fairly large level parking lot. There was a museum there, and plenty of things to see, but I couldn't concentrate on anything except for the fact that, now that I was at the top of the mountain, how was I going to get down? I walked around for about an hour, but I don't remember anything. I finally figured I had to get moving, but not before thinking I might look for someone to pay to drive me and my car back down. I went back to my car, pulled out my video camera, filmed a last will and testament, then started the dreaded drive down the mountain. And once I got moving, it was easy. In fact, I had no problems at all, and got to the bottom without any hassle. I couldn't believe how worried I was. As it turns out, my fear was only when going up, not going down. I felt pretty dumb, but I was also relieved at how easy it was. 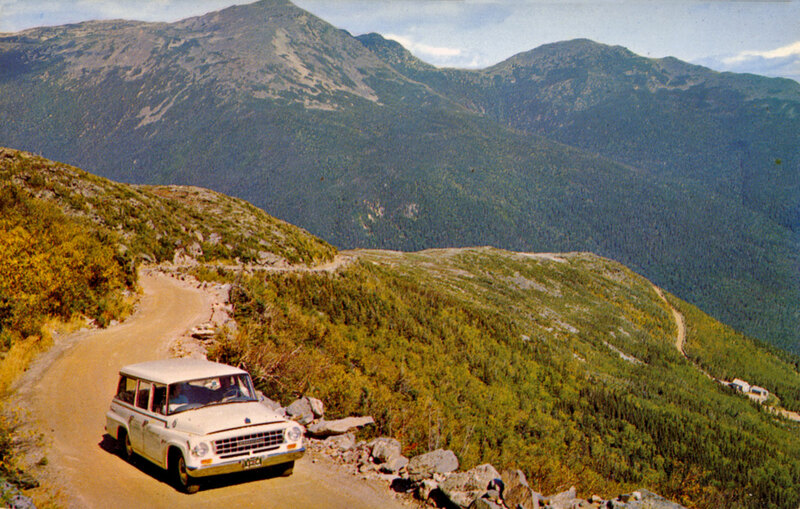 I still look for the mountain roads, and hardly have a problem with them anymore. In fact, my love of roller coasters has only grown as I've gotten older. 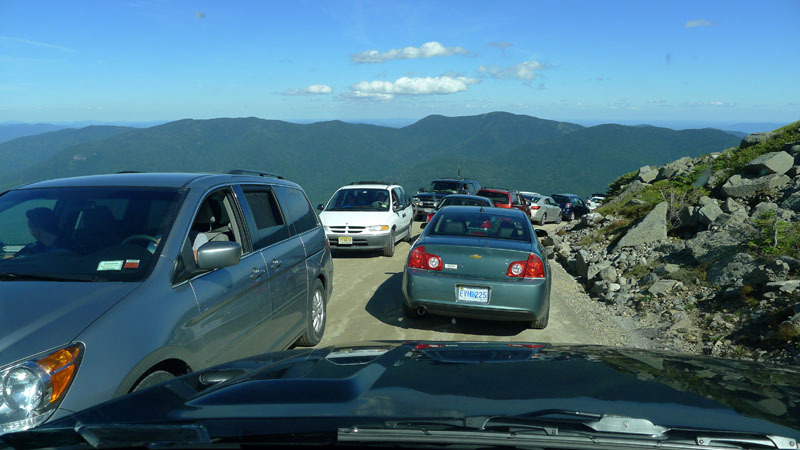 There are a lot of similarities between mountain driving and roller coaster riding. The major difference being you have a lot more control when you're driving. Although, depending on who is driving, one might be better than the other.